There’s nothing quite like enjoying a nice summer day relaxing on your deck with friends and family. That’s why you decided to get it: to spend quality time with those close to you. However, To make your deck fresh like when it was built, you may need a deck cleaning. When the temperatures drop our good old deck sees a lot less use but a lot more elements of abuse. Winter can be tough on your deck and anything that lives outside. It can leave your deck looking dull and can even damage it. So as soon as winter is gone, here are some things you can do to liven your deck back up and get it ready for summer. Keeping it clean is the first line of defense against the elements. A clean deck is a happy deck. A thorough deck cleaning can keep it not only looking good but can also prevent mold from forming. Also make sure you are cleaning around your deck. Plants around your deck can hold moisture that in time can cause your deck to fill up with mold and possibly lead to rot. The first thing you can do to keep it clean is to give it a good scrubbing with soap and water. In most cases this is all that’s needed. If you need some additional help, there are some products that can help remove stains, mold, or any other type of buildup. If you need to take it step further, power washing is a great option. It can reach places that are very hard to get to just with a garden hose and brush. The one thing to keep an eye out is that it can also strip off some of the finish from your deck. That’s not necessarily a bad thing though, as long as you plan on re-treating your wood. After cleaning your deck, you might notice that it looks better but not quite as you remember it. That’s because finish on the wood might have started to break down. This is normal, especially if you went the power washing route to clean it up. Refinishing the wood is a fairly simple thing to do. Start by giving it a light sanding and apply either a dye or a sealer. Some sealers include a dye if you wish to change the color of the wood a bit. Before you start, make sure that you find 2-3 days of sunshine. Even a slight drizzle can ruin the sealer and you might have to sand and reapply it again. Although there are many things we can do to make sure we extend the life our wooden deck the wood can eventually rot. To start off you need to evaluate the extent of the damage. How many and which boards and pieces are damaged? What usually happens is that when you start replacing the pieces that you found rot on you will probably find more. So make sure you are prepared to for that, both with time and budget. This is one of the cases where you might want to hire a contractor, because the process of finding and fixing rot can be very time consuming if you don’t know exactly what to look for. 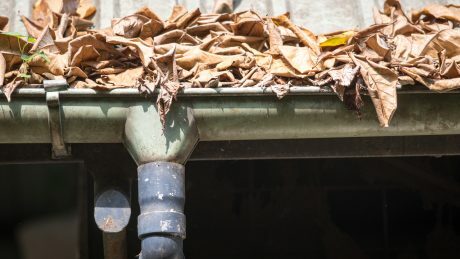 Any homeowner knows the importance of keeping the gutters clean. And any who don’t know, find out the hard way. The fact is that from roof to basement, your house is a single system, and if one<img class="alignright wp-image-158 size-medium" src="http://cincinnatipowerwashing.com/wp-content/uploads/2016/04/commecial-sidewalk-1-199×300.jpg" alt="Cincinnati Power washing" width="199" height="300" srcset="http://cincinnatipowerwashing.com/wp-content/uploads/2016/04/commecial-sidewalk-1-199×300.jpg 199w, http://cincinnatipowerwashing.com/wp-content/uploads/2016/04/commecial-sidewalk-1-200×301.jpg 200w, http://cincinnatipowerwashing find more info.com/wp-content/uploads/2016/04/commecial-sidewalk-1.jpg 311w” sizes=”(max-width: 199px) 100vw, 199px” /> part is broken or not working as it should, it affects the entire house. Clogged gutters may not seem like a major problem but they can cause leaky basements and even damage the foundation. Pressure washing gutters can solve those clogs. Fortunately with exterior house cleaning and pressure washing gutter services, it’s easier than ever to keep gutters clear and running, carrying rainwater and snowmelt to where it should go rather than to where it should not. Regular maintenance can prevent a whole lot of problems, from leaky basements to roof algae to mold. Roof algae can grow upward from clogged gutters and damage the roof by weakening shingles, which may become loose or start leaking water into the house itself. Gutter cleaning can help to prevent these problems before they occur, and keep your house structurally sound and strong. House washing companies use pressure washing to clean gutters, decks and exteriors, to maintain your home in pristine condition. The most important safety tip is to become familiar with your pressure washer before ever even turning it on. This is done by reading the pressure washer’s owner’s manual. Learn how your pressure washer works and what special and safety features it has. You should always use the hose diameter, flow rate, and nozzle that your owner’s manual recommends. Don’t try to get fancy and change any of these, as doing so can result in injury or pressure washer malfunction. It’s recommended that you start spraying at a distance far from the surface you’re cleaning and then work your way towards it until you find the optimal distance that’s both safe and effective. You want to make sure that the spray isn’t hitting the surface and then bouncing back and hitting you. Power washing should always be done wearing heavy-duty pants, long sleeve shirts, and eye protection. A pressure washer should only be operated while your standing on the ground. Never use a pressure washer while on a ladder or roof. Use the correct pressure for the surface your cleaning. A pressure rating of 3000 psi is recommended for concrete. Soft woods call for a pressure rating of around 500 psi. Hard woods call for a rating around 1,200 psi. One of the nice things about using a professional powerwashing company is that they will be able to adjust quickly to the different pressures needed for for different surfaces such as roofs. All pressure washers come with built in safety features that should be routinely checked to ensure they’re working properly. Most of these features are very important because they prevent the temperature and pressure of the water from reaching levels that might cause injury. The owner’s manual should have a list of approved detergents to use with the power washer. Do not use any other detergents. Also, match the correct detergent with the surface you are cleaning. If you’re using a gas unit, it’s imperative that you always use it outside, stay clear of flammable objects like paint thinners, and regularly check for gas leaks. Power lines, circuit boxes, telephone junction boxes, and outdoor fixtures are all electrical hazards you should avoid when pressure washing. If any of these are damaged by a pressure washer, they can seriously injure you or another person. Remember, reading and understanding your owner’s manual is the most important. Follow it and use proper clothing, and eye protection to minimize the risk of injuries such as lacerations, bruises or punctures. If you just want to get the job done without all of the risk, call an exterior cleaning professional and get it done right. 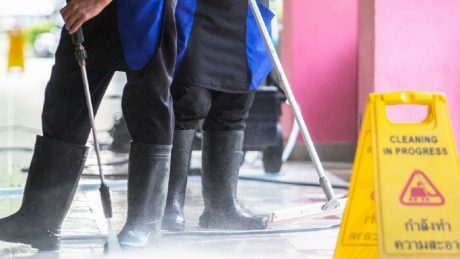 If you walk onto a business property and the sidewalk is stained or covered with mildew or bubblegum, you tend to make an impression of that business. Well so do your customers. Your driveways and sidewalks may be the first impression that you have of your company so make a good one with a power washing of your business premises. Concrete is one of the hardest things to clean due its pores nature. It absorbs tree sap, dirt, minerals, and rust that sink deep into the surface. Because concrete replacement is expensive, it makes a lot more sense to clean your driveways, patios, sidewalks, commercial garage, loading docks, parking lots and any other commercial concrete cleaning before it suffers deterioration from the elements. In today’s business environment you need to hold all advantages and look the best until you are see it here. Your business image starts at the parking lot so let our team of commercial concrete cleaners give you an advantage over your competitors. 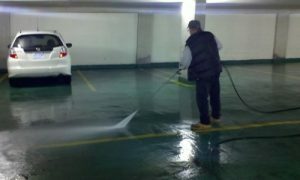 Your building or parking lot will benefit from having your facility professionally power washed to remove oil, mold, dirt, pollen and any other contaminants. Don’t lose customers because you need commercial concrete cleaning. Call us today for an instant quote. Decks are a cherished part of a home. It makes sense to properly clean them. We’ve found that power washing is the best way to do so. 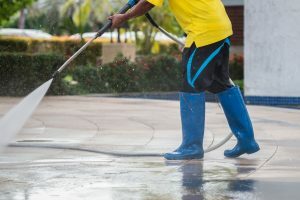 We’ve also found that many homeowners run into problems when they try to power wash their deck without being educated beforehand lasix australia. This quick guide to power cleaning decks will give you all the information you need to know to properly clean your deck. Make no mistake about it: chemical deck brighteners will not actually clean your deck. They might make it look nice and shiny, but the real cleaning work is left up to pressure washing. Choosing a pressure washer is simple if you know what to look for. Pressure ratings are important. Pressure ratings should be determined by the type of wood your deck is made of. Softer woods call for pressure ratings around 500-600 psi. Harder woods call for ratings around 1,200 psi. When cleaning a wood deck, you should never use a pressure rating greater than 1,500 psi. Doing so can ruin your deck. Expert Cincinnati exterior cleaning companies recommend a 40-60-degree fan or rotating tip. These types of tips allow you to tailor the pressure and speed to meet the surfaces you’re cleaning. They provide a huge advantage over set tips, which should never be used to clean wood. Make note that you should always be working with the wood’s grain by spraying lengthwise. There’s no getting around the fact that power washing will cause some wood fibers to be raised. Even the best Cincinnati exterior cleaning companies admit to raising wood fibers on each and every job. The key is learning how to fix them. Spot sanding can be done on minimally damaged areas to smooth things out. For other areas, it’s recommended that the entire wood deck be sanded and then refinished. A 60-80 grit sandpaper should be used on the deck’s surface and a 100 grit sandpaper should be used on handrails if you have them. Don’t become a homeowner horror story. Use this guide and its recommendations to have your deck looking clean without being damaged. 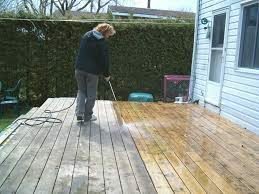 Choose a proper pressure washer and tip, use proper technique, and fix raised wood fibers to make sure your deck looks as good as ever. If you decide that you want to have a professional do it without all of the renting machines, buying chemicals, and the general mess that power spraying makes, give the guys at cincinnatipowerwashing.com a call.